Industrial light cages have been pretty popular- both authentically vintage and modern reproductions- for a few years now. Designed to protect factory or ship workers from exploding glass bulbs, they are found in funky antique shops, but in fewer and fewer numbers. I’ve been lucky enough to find a few of them in my day, and I had this idea to upcycle them into Christmas luminaries . From a Christmas decor standpoint, these antique light cages are a great size for tabletop displays- plus they add a little height to whatever you set them on. …for rustic industrial Christmas decor! With the holidays looming around the corner, I decided to pair my collection of industrial light cages with some vintage sheet music that I had picked up on one of my junkin’ adventures. My hope was that they would work well together as rustic Christmas luminaries (using LED candles, of course). This post contains affiliate links for your crafting convenience. Festive, pretty, perfect for upcrafting! This might be, my friends, the EASIEST Christmas craft project ever so long as you have antique light cages and vintage sheet music. Ready to get started? Step 1: Coil the paper and insert into Light Cage. I know, I know…it’s SO COMPLICATED. Step 2: Cut or tear at desired width/height so that it fits the interior perfectly. Connect the ends of the sheet music together to keep it from uncoiling inside the light cage. That’s literally it- light cages, sheet music, and tape. In a couple of minutes, you’ll have an entire set of rustic Christmas luminaries! And the best part? None of this is permanent!! A trio done in minutes- maybe even seconds! Step 3: Add the brightest amber battery operated LED candles that you can find. Obviously you can’t use real candles, as the sheet music would catch fire very easily and pose a dangerous hazard. And that’s it- instant Christmas luminaries with an industrial, rustic feel! Not too shabby, eh? I think a cluster of these Christmas luminaries would look lovely on your holiday table…a little masculine…but a little romantic. Upcycling at its easiest! And the best part, nothing is permanent. So I can easily undo this (seriously easy- pull the sheet music out) for something completely different, such as this project for Spring. 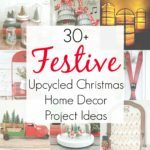 Looking for more upcycled Christmas project ideas and inspiration? Check out my full collection here! These are beautiful! Nice job! De-light-ful. 🙂 They look so pretty with the candles. Glad you went for the LEDs with the paper. A real candle would start a fire quickly. ohhh ahhhh yes love these! I was worried for a minute until you said led candles 🙂 Sorry about the paper cuts, sheesh those things hurt! love the Light Cage Luminaries! They would be perfect just about anywhere and any time of year! Love these! Thanks for sharing them at the Vintage Inspiration Party! Bragging about them on FB today! Very cool. I’ll have to keep my eye out for those the next time I’m treasure hunting. Thank you for the inspiration! I have several of these that came from our family dairy farm – always thought they were cool by themselves but now they are even better! I just love them!! And this project isn’t permanent so you can totally do something else with them after the holidays! I found these over at On Display Thursday. These are beautiful! Who would have thought…well, evidently, you did! Very creative. I am always looking for old sheet music, there are so many wonderful things to make with them. These cages would be wonderful with spooky images for Halloween, too. Exactly- I love the idea of using these for different holidays/seasonal themes!! This looks awesome! I will have to see if I come across any light cages in my travels (there is an awesome antiques market in the next town over). Thanks for sharing, stopping by from #MomTimeThurs. Thanks for the invite, Bonnie- done and done! Thank you so much for attending week 11 of #PureBlogLove and linking your fantastic blog post. These look fantastic! You must have the most amazingly decorated house! I can’t wait to see what you have in store for our party next week Thursday 8 PM EST- Sundays at midnight. Your post has been added to the #PureBlogLove Pinterest board for all to see 🙂 Have a great day! I likesy cubed to the nth power of infinity. Even with the possible danger of hand cramps and paper cuts. Thank you for sharing these at Make It Monday. I likesy that you can un-Make It Monday too! Thank you SO much for this. I have about 10 of those out in the garage that my husband found on a demo job. I think they came out of an old gymnasium. I’ve been hanging onto them because they seemed good for ‘something.’ LOL Now I know what it is! I can’t wait to make these. Thanks so much!! They would TOTALLY look awesome with maps!!! Hahaha, don’t all good DIY’s leave you with paper cuts and hand cramps?! Thanks so much for linking this up to the Found & Foraged party! I hope you’ll come again this weekend – and Happy Thanksgiving! How thrifty! I love the metal cages they’re fantastic. I would love for you to link up over at Scraptastic Saturdays. I pin all projects and share via Facebook and Twitter. Hope you have the chance to drop by. Have a wonderful week. Done and done- thanks for the invite, Andrea!! You’re welcome! Thank you for sharing and linking up to Scraptastic Saturdays. This post has been shared via Facebook, Twitter and Pinterest. Have a wonderful week. This is such a lovely idea! I am glad that you risked your crafty hands to link up to On Display Thursday. This is Denise from Denise Designed stopping you from Sunday Features. Thank you for having linked up. Appreciate it! These are soooo pretty! Love the sheet music in them. Your right it can’t get any easy than this project.